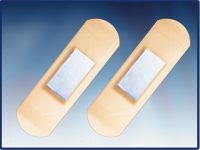 Cure-Aid® Dressing Strip eXsorb wound dressing with highly absorbent pad. The pad made of blend of superabsorbent acrylic fibers and viscose fibers, thermally laminated to a low adherent transparent PE net. 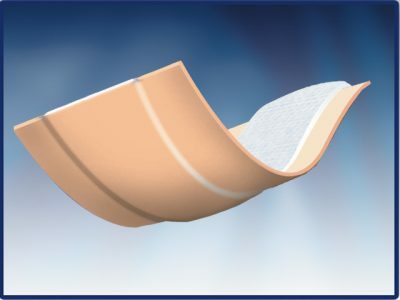 The pad absorbs and interacts with wound exudates to form a soft, hydrophilic, gas-permeable gel that provides a moist environment that is believed to facilitate healing. Can absorb and trap up to 30 times its weight of blood and fluids. The pad can quickly absorb wound exudates and form a gel. Exudates are locked inside the dressing away from wound and surrounding skin; this prevents maceration and retains a humid surface environment to facilitate wound healing. The pad can keep the absorbed exudates even under compression. The high absorbency allows for fewer dressing changes, leaving the fragile wound bed relatively undisturbed. Soft fluffy conformable wound pad providing cushioning effect. Atraumatic and painless dressing removal. The presence of PE net as a wound contact layer allows fast, controlled absorbency of light exudates. Covering skin scratches and minor cuts, also used as a pressure pad to stop bleeding for first aid dressing. Dry wounds or wounds covered with hard necrotic tissue. It depends on the state of the wound. In case of sloughy or heavily exuding wounds, the dressing should be changed daily. For lower exuding wounds, the dressing could be left in place for longer time. 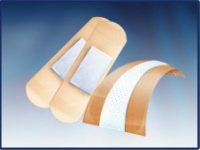 Wounds that show signs of clinical infection may be dressed with Cure-Aid® Dressing Strip eXsorb but the dressing should be changed daily and the use of systemic antibiotic therapy considered. The dressing should not be used on patients with a known sensitivity to this dressing or one of its components. Select pad size around 2 cm larger than the area of the wound. On lightly exuding wounds it is possible to apply the dressing then gently moisten the area directly over the wound with sterile water or saline. Cure-Aid® Dressing Strip eXsorb can be applied without secondary fixation dressing. The dressing is integral enough to be removed as one piece. In case the dressing slightly adheres to the wound, irrigation with saline helps removal without pain or trauma.